When executing on strategy, there are two realms of action: measured and unmeasured. A management axiom "what gets measured gets done" may be true, but is too limiting. When what is unmeasured gets done, you have a strategic organization. In my previous posts "Carrying Strategy from the C-Suite to The Receptionist's Desk" and "Measure Mindset, Not Past Performance in Strategic Execution," I state that without strategic mindset, doers will only do what is measured in an execution plan. They won't think "out of the box" to intuitively take aligned actions that are not part of -- and may even be superior to -- a plan. Maximum strategic execution requires extending strategy mindshare. 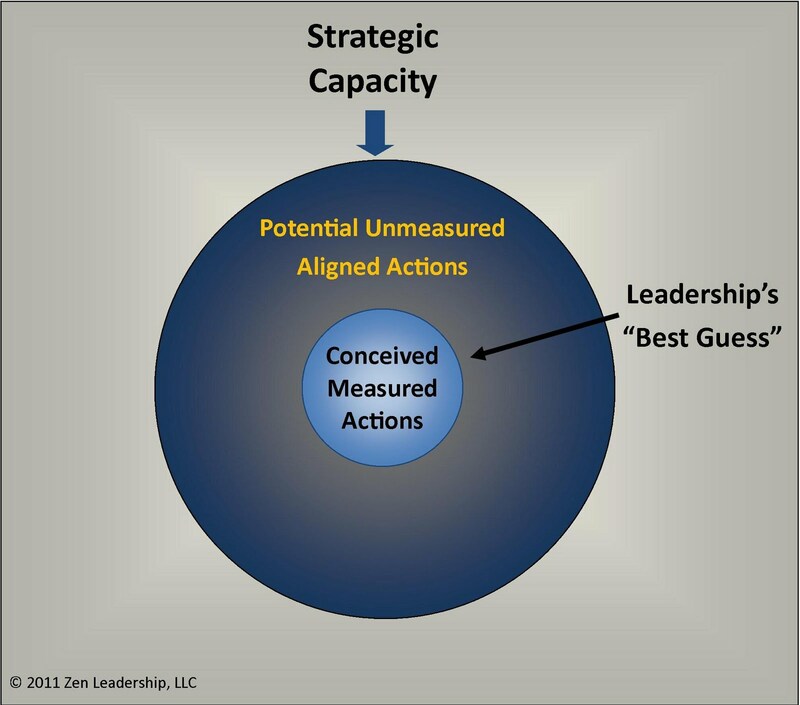 Measured actions are simply leadership's best guess at which actions will achieve results towards the strategic vision. 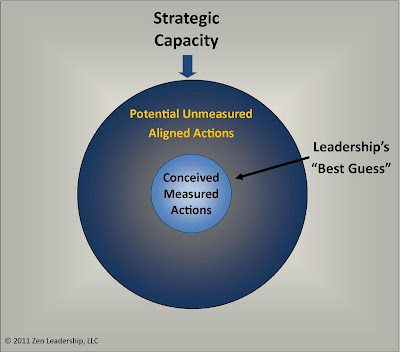 But by focusing on measured actions only, a much larger realm of possibility for aligned action is excluded, which prevents organizations from reaching full strategic capacity. To open up access to the whole range of potential aligned actions, what we need is a sphere, not a single line. In other words, since there may be a vast array potential means to the same ends, if we prescribe only a specific set of means, we are unnecessarily preventing exploration of a potentially better path. Instead, create a container of context that keeps actions aligned with the outcome, regardless of whether those actions are measured. Imagine a swarm of bees headed to the hive. While it may look disorganized, if the swarm were to follow a single-file line and the leader encountered an obstacle, like a tree, the entire line would get backed up like a multi-car traffic accident. The fact they are not taking a single path to the destination is, in fact, more efficient. Rather than put our focus on the path, we should put our focus on the destination and on ensuring the whole swarm is clear we're heading to the hive. Thus, strategic execution is not about directing people to follow a single path toward a destination, but ensuring they know the destination. A container of context is created through repeated strategic conversation. Strategic conversation is not talking about vision, goals, objectives and action plans. Strategic conversation that creates context is describing in vivid detail what the end point looks like. Describing the features of the beautiful house on the hill, not the blueprints and designs. In my previous post, I explained that a couple buying a custom home is not excited by the blueprints. What excites them is picturing themselves by the swimming pool or enjoying coffee in the sun room -- a mental picture of the end point. Creating strategic context requires ongoing conversation with those involved in building the vision where we create a shared mental picture of the end point. It is a mental picture of the experience of achieving it, not simply memorizing a written vision statement. 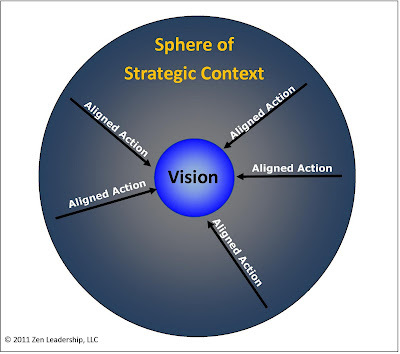 When the entire organization acts within the sphere of strategic context, ideally, all actions become aligned to the vision, whether they are measured or unmeasured. Thus, strategy lives in unmeasured action. If alignment exists independently of plans and designs, the organization maximizes its odds of fulfilling the vision.